Quick to set up, and pack up too. This model is the perfect mix of simple design and quality materials, born and bred for Aussie touring. Designed to be super easy to set up - simply peg out the four corners, extend the corner poles and the tent will stand up before you. 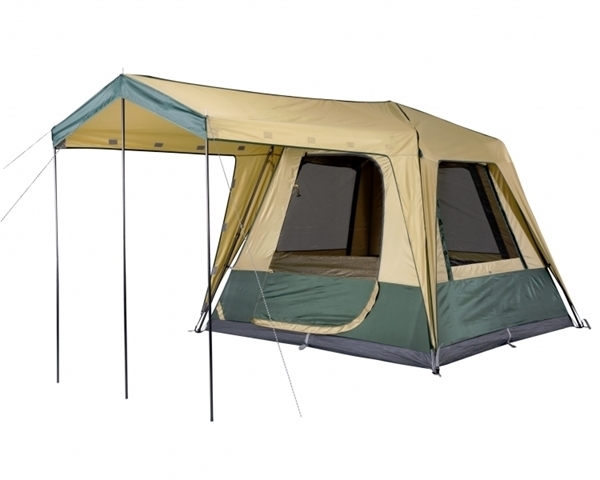 Finally, draw the fly over the inner tent, set up your awning and relax! Ideal for touring where you're putting your tent up and down each day or for someone who prefers to spend less time setting up and more time relaxing. Large front awning for plenty of shade, spreader bar for awning included. A lightweight design makes it easy to carry to your campsite too. 150 Denier rip stop polyester material. UVTex® 2000 Sun Tough Fly fabric - the UVtex® treatment not only protects the fly from harsh UV rays, it also doubles as a 100% waterproof barrier. Posi-Brace securely fastens your fly to the tent with these Velcro® attachment points. 150 denier polyester inner tent with No-See-Um mesh windows for ventilation but no biting insects. Tensile Tab with J-Hooks keeps the poles firmly in position during periods of high wind while Tensile Loops act as shock absorbers at the peg down and guy rope points for greater stability and durability. Heavy Duty DryFloor - Incorporating a bucket style floor with elevated seams keeping the moisture out but more importantly, you dry. Heavy gauge 16/20 mm steel frame with non-corrosive plastic hubs provides quick set up, greater strength and improved water shedding. Large mesh walls on the inner tent allow for great flow through ventilation. Large windows are built into the outer tent to allow you to completely control the climate. Ideal for moderate to tropical conditions. 1 centrally located lantern hook.